The First Geodesic Mission arrived in Ecuador in 1736. It was undertaken by the Frenchmen Pierre Bouger, Luis Godin and Carlos Maria de la Condamine as well as the Spaniards Jorge Juan and Antonio de Ulloa and an Ecuadorian Pedro Vicente Maldonado. The purpose of their mission was to scientifically verify the roundness of the Earth. After the visit of the Mission, whose studies lasted nine years, the territory surrounding Quito started being called ¨The Lands of the Equator¨. This was named in reference to the parallel line that divides the planet in two hemispheres. A second mission arrived to Quitenian ground in 1802, headed by Frenchman Charles Perrier. He established himself in the country and corroborated the data obtained by the first group of investigators. 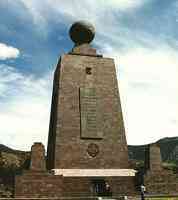 In 1836, the Ecuadorian geographer, Luis Tufiño, located the landmarks left by the First Mission, and, to commemorate the visit of the scientific expedition, an obelisk ten meters high was erected in San Antonio de Pichincha, which was later transferred to Calacali by the Provincial Council. This historical monument of 10 meters of height was located in this site by 43 years, until 1979, in which it was transferred to the population of Calacalí to 7 km to the West, by where also crosses the Equatorial Line. One denominates Equatorial Monument because its piramidal-quadrangular form with its four monoliths in the angles, it has the geographic direction of the four cardinal points, and one is located in the Equatorial Line of latitude zero degrees zero minutes and zero seconds. This Line pass by diverse countries and continents, but solely there is a single country that takes to its name "the Republica of Ecuador". This quadrangular piramidal set has the same geometric appearance of the previous one, with its four monoliths in the angles and their sides have the geographic direction of the four cardinal points. Thus we have to the North a commemorative legend, dedicated to our Ecuadorian wise person Pedro Vicente Maldonado, who collaborated closely with the Geodesic Mission in the year of 1736. An engraving is observed that represents the quarter of the circle used by the Geodesic Mission of century XVIII. In the Western Hemishpere we observed a plate dedicated to two I illustrate Spaniards who collaborated in the scientific work of France. Here is engraving the shield of Spain. In the South Hemisphere we have a plate of recognition of the Government from Ecuador to the scientific work of the Geodesic Mission of France. Here we see an engraving of the shield of Ecuador. Alongside This of the monument a plate is dedicated to the academic French who determined the dimensions of the Earth in century XVIII. In the superior end of the pyramid, a metallic sphere that it represents the Earth, with its 5 continents and their seas in stop and under relief stands out. This globe is surrounded from East to the West by a metallic, indicating tape also of the Equatorial Line, dividing to the sphere exactly in two halves. It has an approximated weight of 5 tons and 4.5mts of diameter. The direction of the metallic globe corresponds to the real Earth position, that is to say, that the smaller axis of the poles is parallel to the axis of real rotation of the Earth. The Galapagos Islands, off the coast of Ecuador, have captured the hearts and imaginations of people for the past two centuries.